Sometimes, we need a firm mattress - and other times, we only need a topper. People have a variety of needs for their beds, and what works for someone else may not be the right choice for you. If you want to buy a firm mattress topper, though, here are our top choices. Before we get to the list, though, we think it's important that you know how we picked them. After all, if we were just trying to sell things to you, that wouldn't be very convincing! First, we researched firm mattress toppers online to get a sense of what products are actually on the market. This is better than looking in stores around where we live since those stores won't necessarily stock the best brands. We discarded any toppers that weren't firm enough since firm toppers are the focus of this guide. Next, we gathered as many reviews as possible for each product, checking to see what actual buyers thought about them. As much as we'd like to have personally tested every mattress for hundreds of nights each, this guide couldn't have been written if we had to do that. Instead, just like most people who buy products online, we decided to borrow the wisdom of the masses. Finally, we evaluated each of these products for additional benefits or features. 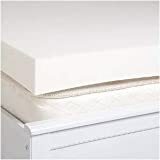 There isn't a lot of variety in mattress toppers, but products that are better at guarding against allergies, mites, and other problems were valued a little better. Since this is a guide to the best mattress toppers, the price was not a metric we used for most of these. However, we did look for a firm mattress topper that would be available at lower budgets, even if it wasn't among the best overall toppers. Some of our team felt this was important for balance in our guide, and ultimately, the rest of us agreed. For more information on which types of toppers may be right for you, check out this useful guide. That's quite a name, but there's a lot to love about this particular firm mattress topper. This carefully-designed latex topper has a 5.0 lb/cubic foot density of natural latex, which provides medium-firm support to the entire body. As a dense product (mattress toppers are often around 2 lbs/cubic foot), it lasts considerably longer than many of its lighter competitors, and that alone puts it in a good position. More importantly, this is a heat-neutral product. This means it won't absorb heat from your body and it won't change firmness based on the temperature of the room - no more changing toppers when the seasons shift. Instead, it uses an open-celled design to allow air to flow through. That won't make a bed cooler all by itself, but if cool air is coming towards you, this bed will let it in. For the best results, you'll want to get a 3-inch thick topper. The 2-inch model is the most popular, offering support to the body while permitting the feel of the mattress below to push through, but the 3-inch is better if you want a significantly firmer mattress. 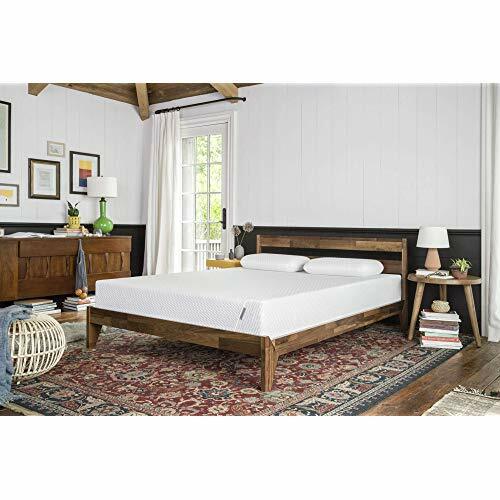 As we looked over reviews for this product, one thing that stuck out to us was that many buyers felt this topper was outright superior to memory foam. Quite a few buyers noted that they thought the extra cost was worth it, and that ringing endorsement helped propel this product to the #1 spot on our list. Sorry about the names, by the way. We have to include them in full, so you can find the product we're talking about. Anyway, this firm mattress topper is designed to add instant firmness to beds. Unlike the better-known memory foam, the polyurethane foam used in this product doesn't really cling to the body or contour to your foam. This provides more support when you're sleeping and sharply reduces the amount of sinking down that normally occurs. Thinner versions of this product are available, but just like our #1 choice, we don't recommend buying those when you're looking for a firm topper. Also, while this is an artificial product, it's made with an eco-friendly process and monitored by independent, outside laboratories to ensure no prohibited chemicals are making their way into this topper. 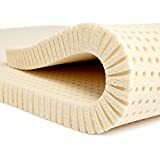 The main reason this isn't our #1 choice is that polyurethane foam isn't quite as good at allowing airflow as natural latex is. It's still measurably better than basic memory foam, but it doesn't help to get a firm mattress topper if the airflow is so limited that your body heats up. Public reviews of this product are generally positive, with most people citing the firmness of this topper as one of the main things they like. Several of the more neutrally-oriented reviews mentioned a wish for this product to be firmer than it already is, and even the supporters agree that it's only about medium-firm at best. Keep that in mind if you're shopping for an extra-firm topper. 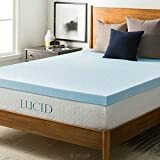 LUCID's 3-inch gel memory foam topper is a good choice if you need something that's firm, but that also contours to your body and helps alleviate pressure points. Unlike ordinary memory foam, gel memory foam is better at dispersing heat and allowing you to sleep as comfortably as possible. Unlike most manufacturers, LUCID offers several varieties of this product. The gel-infused version is the most popular because it helps to dissipate heat, but it's not your only option. Other choices include a lavender-infused topper (for a great, comforting smell), a bamboo charcoal topper (that regulates odor and moisture), and an uninfused version in case you want to sleep warmer. Different people have different needs when sleeping, and we're happy to see manufacturers taking the initiative and providing real options. This topper isn't quite as firm as the first two, but on the other hand, it wasn't really designed to be, either. Instead, it serves its purpose as a topper that provides moderate firmness with your choice of an infusion to ensure a perfect night's sleep. The most expensive product on this list is in 4th place mainly for that reason. 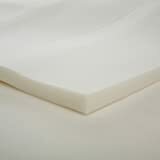 Dreamfoam Bedding's Talalay latex offers a naturally-resilient product with significantly more pressure relief than many of its foam competitors. The topper itself is encased in a bamboo fabric topper that helps stop allergies and microbes, allowing for a safer and more comfortable rest. However, it's important to note that this is a blended latex with only around 25% natural products contained within. The rest of it is various chemical fillers. That's not inherently a bad thing when you're judging by effectiveness - it was enough to get this product onto our list - but it's still not as good as 100% pure, natural latex. Given the added filler materials and the higher price, we can't recommend this product over our #1 product. It's not bad; it's just that there's a better product at a lower price. You get what you pay for - and that's especially true with this thinner foam pad. This product is not as good as any of the other four products in this guide, and if you can save up for those instead, you should. However, if you just want to adjust the feel of a mattress on a lower budget, this product is worth looking at. As a 1-inch topper, you're definitely going to feel the mattress beneath this. What this topper really does is flatten and firm when you're sleeping, providing a bit of firmness and contouring without significantly changing the overall feel of your bed. However, an average person will notice a difference while using this. Some buyers suggested buying two of this product and layering them on the bed. That gets the topper closer to 2 inches, which can start to make a real difference in the way your bed feels. This is especially helpful if you're buying a foam topper for a smaller bed, since you may be able to keep the total cost under $50. We can't over-emphasize how limited this topper is when compared to some of the better options on the market, but if you want an affordable product that's at least good enough (if not great), look at this as your first choice.